What happens when some content you’ve wanted to put on Careers Online “forever” finally becomes available? Simples! Build a brand new 500+ page section! And then call it COL’s Job Guide ? 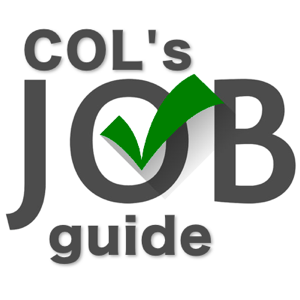 This NEW section at Careers OnLine (COL) contains a wealth of detailed information about Australian jobs. There are over 500 Aussie jobs available here! You’ll find on each page detailed job descriptions, including some of the normal tasks that person might do. You can discover the personal qualities and the education and training needed to get started in the job… Along with areas of specialisation possible. What I really love are the employment opportunities and outlooks for jobs in Australia are readily accessible, along with direct links to current job ads in that field! And there’s lots of new extra links which can help you find out more about that job! I’ve always wanted to have this type of job info here @ Careers Online since I started it way back in 1995. It was provided by the Australian Government for most of that time. Since they were doing such a great job, it would have been silly to reinvent the wheel. But when I found out their support for the Job Guide was withdrawn, and the core content was now freely available… Woohoo! We’ve put our own “spin” on the content and given it a huge update in this first release (April 2017). The data has been greatly “cleansed”. And we’ve added new links and new content. And I’ve just also found a whole world of new data is now available… So lots more new content is scheduled as part of our ongoing promise to keep this updated! We’ve integrated this into our updated and expanded Job Seeker’s Workshop. I do hope you like the changes we’re making here. P.S. Yes… the purists will say the last edition of the Job Guide was in 2015. However, health concerns here meant our version was delayed until this year.